by Melissa S. Williams, Rosemary Nagy, and Jon Elster (ed.) New York University Press, 2012. New York. 384pp. Hardcover $60. ISBN: 9780814794661. This edited volume assesses the role of transitional justice in transition periods, when nations are attempting to move from authoritarian regimes toward democracy, or coming out of civil wars. Truth commissions, reparations, and criminal tribunals are a few of the mechanisms that societies might try to use to heal divisions and reinstate or adopt a rule of law. The editors of this issue put together a well-balanced selection of both theoretical and empirical pieces on transition in post-conflict societies, and an amazing group of scholars with broad theoretical and empirical expertise. In contrast to more standard conceptual and empirical studies of regime change, it also offers an informative analysis of transitional justice - not only justice after regime changes (for example, see Webber and Vermeule's respective contributions, pp.98-128 and pp.151-165). This volume differs from many scholarly works on the often emotional subject of transitional justice. What emerges from several contributions is the critical treatment of transitional justice institutions as one-in-all-devices, with both an instrumental purpose – to enhance democracy – as well as the normative purpose of delivering justice. Another important element of several contributions is a revitalization of the discussion on “rough justice,” meaning compensatory cash reparation, a practice that is often condemned by research, but one that is often used as one tool in transitional justice. Nevertheless, some arguments in the respective contributions are presented as recent findings, while in truth they are already quite established in transitional justice research; for example, the idea that individual mechanisms combined with complementary mechanisms foster “successful” transitional justice. This volume starts with an introduction by Williams and Nagy, who discuss the four broad topics of the different contributions: dilemmas of transitional justice, realism, idealism and non-ideal theories, the question of whether transitional justice is special, and the impact of transitional justice institutions. With this they open the discussion of this diverse topic and establish a coherent path for most of the included texts. This review is structured along this organizational scheme, and discusses them in an order guided by their theoretical or empirical direction. 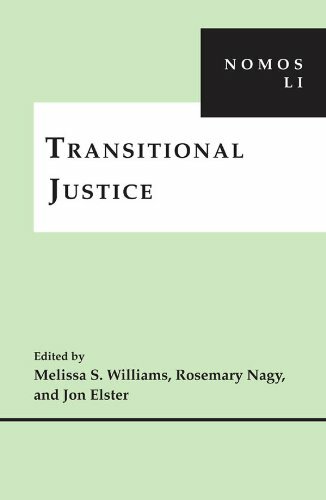 Elster’s contribution is an insightful summary of transitional justice and a helpful conceptual tool in describing the different relevant terms. His plain reflection on justice, truth and peace and [*559] their intrinsic and instrumental value points to a deeper understanding of the difficulties in the practice of transitional justice. Considering variations of the relation between these three broad terms, he offers concrete paths for further research. Yet, as Elster admits, one is tempted to say, “what’s next?” Therefore, it will be interesting to see empirical results based on his 10 concrete assumptions (pp.93-94), as Cohen and Lipscomb present in their contribution. De Greiff's broad conceptual essay on the differentiation between the compromise position for the nature of justice and an application of the principles of justice under distinct circumstances is a broad overview of several important concepts and terms. What de Greiff emphasizes here is the assumption of a normative perspective of justice, which is ‘given’. But, from a comparative perspective on justice in transitional contexts, this argument is ultimately not tenable. It should be rather argued that not the transition context makes justice specific but rather that the norm-based perspective on justice is already influenced by context-specific social constructions. Based on the contribution's few conceptual remarks and its lack of thorough discussion, the approach is not entirely convincing. Arguing in a similar direction Webber’s text on retrospective and prospective justice systematizes different justice concepts. Although his approach was to offer descriptions for transitional justice in varying contexts, the examples used to clarify the argument are mostly classic regime-change centered. And although the examples discussed to foster the approach of a third type of transitional justice are very well selected, it remains unclear why this third type is not basically an instrument of retrospective and prospective justice. From different angles Debra Satz, Adrian Vermeule and Gary J. Bass discuss in more theoretical contributions one of the most traditional topics in transitional justice: compensation. New in Satz’s argument is, for example, the perspective on the different impacts compensation has, both in cases of individuals and in cases of members of a community. Her reconstruction of the perks and perils of compensation on an abstract level results in the conclusion that “(t)here is no single best form of compensation and no single justification for offering it” (p.147). This is intuitively right. Moreover, this contribution is valuable in that it serves first to clarify these basic ideas, and second to emphasize the specifics of the receiving end of transitional justice. Vermeule’s arguments are, albeit to a certain extent convincing, not thoroughly discussed. The assumption that problems of compensation are similar in non-transitional and transition contexts is especially interesting; nevertheless it would be helpful to describe the discrepancies in more detail and with this come up with more tenable arguments. This holds also true for Bass’ critical realism, which is not fully grounded in a dense description, but is structured as a narrative – albeit informative – of the relations of Germany and Israel, and South Korea and Japan. Cohen and Lipscomb (pp.257-315) offer the most striking chapter in this volume. They enrich the discussion by introducing a tool to evaluate the quality [*560] of how instruments of transitional justice are perceived by the “victimized populations” (p.271). In an insightful and empirically rich analysis of transitional justice in East-Timor, the authors question the value of Elster’s theoretical approach towards the intertwined relation of truth, justice and peace. Cohen and Lipscomb argue that, “(t)he urge to do “more” in quantity may not provide greater qualitative results […]” (p.271) from the perspective of the victims. The criteria Cohen and Lipscomb establish (aspirational goods, adherence to institutional mandates, adherence to international fair trial standards and best practices) share the basic prerequisite of political will. Their argument is fostered by a description of the variety of instruments, established by the United Nations and the Indonesian government without real political support, and at the same time severely constrained by the military. Their critical and detailed evaluation of the different institutional settings implemented in East Timor offers a turning point for transitional justice research: “Perhaps the single greatest contribution of the KPP-HAM [COMMISSION OF INQUIRY ON VIOLATIONS OF HUMAN RIGHTS IN EAST TIMOR] Report is that it succeeded in capturing the broader context of the gross human rights violations that had occurred in East Timor in 1999, setting a high standard both for truth and for the scope of prosecutions in judicial settings” (p.276). With the descriptions of, for example, the Serious Crime Unit and their turning a blind eye to gender based violence (pp.284-289) it becomes clear that with a consistent strategy for prosecution, less could in fact be more. But this approach of “establishing very limited priorities” is the most difficult, as it would favor a more hands -on approach with realistic goals and standards of evaluation than the probably more fashionable holistic ideal. Concentrating on standards of evaluating the impact of transitional justice, Nalepa (pp.316-360) offers in her empirical analysis of Bosnia and Herzegovina some insight how difficult this can be. She asks the demanding question of how we select the observable phenomena used to decide if social reconciliation was successful. Whereas social reconciliation is not the only apotheosis of transitional justice, it is one element with significant impact on both the process of transition and subsequent democratic consolidation. Many readers will want Nalepa to go deeper into the discussion of why refugee returns are an indicator of social reconciliation. Although this is a well-established argument, it is important to discuss the specific problem surrounding the refugee return in former Yugoslavia, as Hart (2011) has described. The authors of this volume systematically identify standard assumptions about the role of transitional justice in democratic transformation, the impact of transitional justice institutions and make with this a substantial contribution to the study of transformation processes in post-conflict situations. Turning away from all-too-normative ideas makes it an important scholarly contribution to the transition literature. Hart, Barry (2001). “Refugee Return in Bosnia and Herzegovina: Coexistence [*561] Before Reconciliation.” In RECONCILIATION, JUSTICE, AND COEXISTENCE: THEORY & PRACTICE, ed. Mohammed Abu-Nimer, pp. 291-310. Lanham, Maryland: Lexington Books.